Tripura is getting its first series of Drinking Water Vending Machines or Water ATMs, as they are called in common parlance, from ONGC. 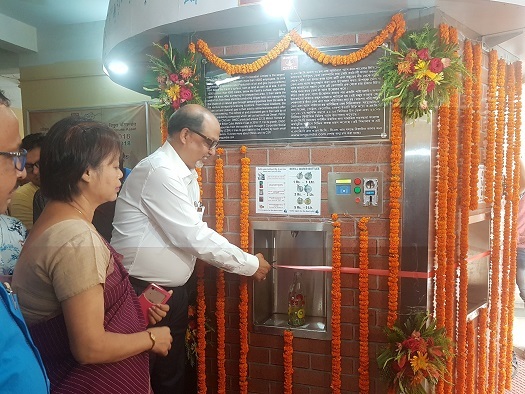 ED-Asset Manager G K Singha Roy inaugurated a water-ATM in IGM Hospital on Thursday as part of on-going Swachhta Pakhwada- 2018. Swachhta Pakhwada, which started on July 1 last and ONGC Tripura Asset under Corporate Social Responsibility (CSR) is installing four Water ATMs in four prominent hospitals of Tripura including Tripura Medical College and Cancer Hospitals. He informed that the next ATM will be at GB Hospital of Agartala and each of the Water ATMs costs around ? 10 lakh. The Water ATMs made by a Tata Group company has an in-built storage capacity of 1300 litres with a provision of storage of 300 litres chilled water. The unit is fully automatic with provision of operation through card as well as currency coins of selected denominations for controlled dispensing. In the last few days, 33,000 plus ONGC employees spread across 25 work centres have sensitized general public on importance of cleanliness through online campaigns, mass SMS, banners, posters, skits, tree plantation etc, besides taking up cleanliness drives at prominent public places and organizing health check-ups of housekeeping workers. Efforts are being made all around ONGC to encourage the employees to participate, propagate and practice Swachhta on a day to day basis.